Connecticut’s General Assembly convenes on February 7th for its 2018 annual session. These even year sessions are generally for budget adjustments only and run on a shorter schedule; from February until May. Of course general non-budget items are often added to the agenda. Even as this session starts, the State budget is still in flux. Multiple special sessions were held last year to complete the budget process. This ended up leaving towns and cities with much uncertainty about how much state money they would be receiving for various local programs and education needs. Even after a ‘final’ budget was passed, they had to go back and make an adjustment which affected the elderly. This adjustment was passed by the Legislature but was vetoed by the Governor. The General Assembly ended up in another special session to override the veto. Education funding was a great concern last year as well as cuts to social services programs. The transportation system is reported to be in extreme need of repair. 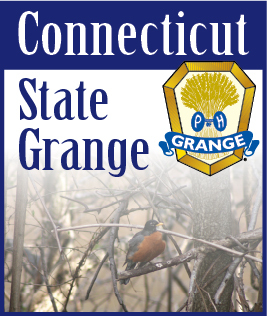 One of the resolutions that was passed at the last State Grange session proposed that the legislature impose a rule that if the state budget has not been settled by May 15th, that the formula for distribution of funds for the Education Cost Sharing Grant, Special Education Grant and Town Aid Road Grant be established as the same as the previous year plus three percent. I did communicate this recommendation along with a couple of other items to my local representative. Connecticut is experiencing a fiscal disaster. The Legislature must carefully craft a budget that reflects realistic expected revenue. It also must study existing programs and determine where and how to adjust our spending. The state may need to add unpopular income generating taxes and program cuts. I see an increasing possibility of tolls returning to Connecticut. There was a recent report of the states that not have implements tolls on roads and bridges. Did you realize that in the Northeast only Vermont and Connecticut do not have tolls? The whole east coast has tolls all the way down including Florida. Going west you have tolls all the way out to Utah. Presently only 16 states do not have tolls. How much more can we increase the taxes on cigarettes and gas? Towns and cities also are in need of increasing their revenue. In some cities outside Connecticut there are additional taxes on hotel rooms. Unfortunately we must look for additional sources of income or drastically cut services and programs.....but where?